D.C. Police Chief Cathy Lanier was \”shocked\” by an officer who intimidated a man videotaping an altercation Sunday and says the matter is now under investigation. MJ wows the crowd at a high school with his moon walk. Well not the real Michael Jackson. owner what he wants and what he doesn\’t want. The actor portraying the lead character in a production of the Peter Pan fairytale in Scotland surprised his co-star and his audience by proposing to the woman who plays Wendy. It took nearly 50 years for Bob Dylan\’s \”Like a Rolling Stone\” to get a video treatment, but it was worth the wait. Ever wanted to know how holiday lights are strung atop some of the country\’s tallest buildings? Watch video of some pros at work. Chipotle\’s video, \”The Scarecrow,\” may be a favorite among its nearly 7 million viewers, but there are a few groups taking issue with the emotional animation. WTOP asked listeners and readers to share their opinions on the government shutdown. Here is what they had to say. Fred Stobaugh saw an advertisement in the local paper about an online singer/songwriter contest and decided to enter. Only, instead of submitting an electronic video or audio file, he mailed a letter. After a near-collision brought about by one driver turning into traffic while talking on a cellphone, another driver takes matters into his own hands. It\’s easy to shoot video with your smartphone — it\’s not easy to do it well. Professionals offer basic how-tos on getting good video with your phone. 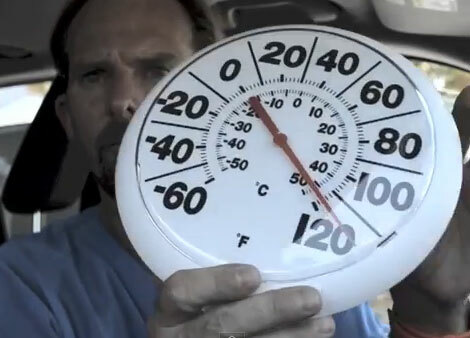 How hot does the inside of a car get? In a video that\’s gotten thousands of views in the past few days, veterinarian Ernie Ward put himself in a parked car on a breezy 95-degree day to find out. a visit to D.C.\’s waterfront fish markets. and a it was all caught on video.